This afternoon I am helping to conduct a prayer rally in the Akron-Canton, Ohio area. This meeting with churches from around the region is for one purpose: to set ourselves right with God and to seek God’s face for revival and the advancement of the gospel. Will you help us pray? Today’s prayer meeting is part of preparation for the God Bless America Rally that will be conducted here in Stark County, Ohio on May 1-4, 2019. I look forward to being back to preach in that meeting. But I am convinced that the preaching is in vain without the praying. The first meeting in the book of Acts was a prayer meeting, and all of the preaching and all of the power flowed out of that. Will you help us pray? Pray! Ask the Lord to send a spiritual awakening to His people, to strengthen churches, and to bring many souls to the Lord Jesus Christ. You can find regular updates on the God Bless America Website and Facebook. Come. 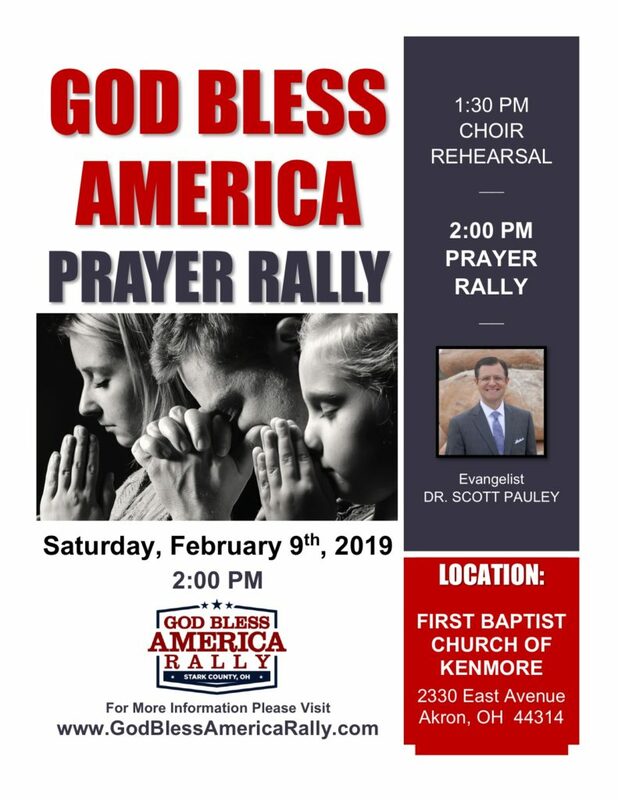 If you are within driving distance of the prayer rally or the God Bless America Crusade we would love for you to join us. Bring a car load or bus load of people with you! If there is someone you are burdened to see saved work to get them to the rally. Full details on the meetings may be found at Godblessamericarally.com/schedule. Go. Each Saturday during the month of April we will have people out witnessing and inviting folks to the crusade. Some laborers are coming to spend the entire month. There will be gospel teams out every day. The gospel cannot be confined to organized meetings! It would be thrilling if you or a group from your local church would be willing to come and help. This would be a great day trip/ministry for a youth group, senior saints group, or anyone who wants to speak to people about the Lord. If you would like more information on participating in this gospel effort you may contact Corban Butler at corban.butler@yahoo.com. Give. An undertaking of this magnitude requires a great investment in every way. If you would like to make a tax-deductible donation to this work you may do so securely at Godblessamericarally.com/donate.